Justin Bonomo, who attended this 2009 WSOP Bodog bowling party, captured his biggest live payday at the 2012 EPT Monte Carlo Super High Roller. Justin Bonomo entered final table play of the 2012 EPT €100,000 Monte Carlo Super High Roller as the massive chip leader. 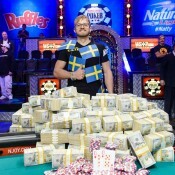 He ended final table play with a massive pay day, capturing the title and banking €1,640,000. 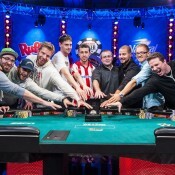 Bonomo defeated Germany’s Tobias Reinkemeier (€1,064,000) heads-up for the title. This makes only the second win of Bonomo’s live tournament career (he captured a WSOP-C event in 2009). The victory nearly doubles his career earnings, pushing him over the $5M mark. Daniel Negreanu started final table play third overall. A win would’ve pushed Negreanu past Erik Seidel on the career live tournament earnings list, but instead he finished sixth for €310,000. Patrik Antonius finished fourth for €443,000. Temp Hutter did not play in the event. Get full results and recap here.